A: Wedding photography is itself a class of photography - or more so, a blending of styles that vary from moment to moment. We certainly have our own unique look that blends elements of candid, lifestyle, environmental portraiture and vintage photography. You may often hear the combination of these styles referred to as photojournalistic or documentary. When shooting, our goal is to tell a story; an honest one — the story of your day as it happened, not as an orchestrated and posed event. You’ll see lots of images of folks naturally just — being themselves. Our portraits are simple and void of heavy posing and props. Each photo should remind you of what happened in that moment; evoke a feeling or even reveal something you missed at first glance. A: That would be me, Zackariah, and my wife, Larissa. I'm the principal photographer of Folk & Lore. I'll be your lead photographer during your celebration and primary contact leading up to and after your wedding day. My wife, Larissa is my equal in the art. She's learned and grown right along side me over the past decade. We share visual styles, creative tendencies, and philosophies on weddings. We currently have a home in Kentucky, but are always on the go and can often be found house sitting and traveling internationally. I'd love to meet you face to face, but depending on our mutual locations, it may work best to arrange a phone call or video chat — whichever works best for you and your schedule. A: When flipping through our portfolio, it may not jump right out from the start, but the truth is, we are not what most people think of as commonplace "wedding photographers". Our visual style is our own, but what separates us from the herd, is our method. We don't do posey shot lists, hours of formal portraits, or table-shots. We are photo-journalistic documentarians. We tell stories. And stories are best told in an honest and genuine way. This means we won't interfere. We won't stop and pose you. Our goal is to remain unobtrusive and unnoticed. When you hire us to photograph your celebration, what you get is the story of the day, as it unfolded, told in the most sincere, candid, and authentic way that we know how and in the most beautiful and artistic way that we possibly can. We've photographed almost two hundred weddings over eight years, and have honed and specialized our craft and our approach. We're not for everyone. And that's okay. If you're looking for a more traditional wedding photographer, please let me know and I can happily make recommendations. A: This is great for multiple reasons. One being that it allows for me to have a chance to hang out and break the ice before your celebration day. We can plan to do this at any point before (or even after, if it makes sense to do so). A lot of our couples will add a portrait session to their wedding photography package when they book me. At which point we can plan and schedule the shoot whenever you're ready to do so. Sometimes this is many months before their wedding day. Sometimes it's the week before. The choice is yours. If it makes more sense or budgets don't allow for it, you could also book your wedding photography first and add a portrait session at a later time. I'll work with you on whatever works best. Q: "Will you help us coordinate photo events such as family formals and portraits?" A: Yes. We are available to help with any questions you might have and certainly have opinions on things, however please keep in mind that we are simply support characters in your story. We're not here to dictate and certainly don't want there to be more focus on porraits than on your friends and family. As documentary photographers, our goal is to sincerely tell the story of your celebration through imagery. We'll be by your side photographing the day as we go. If we do have any say in how the day pans out, we always just err on the side of simplicity, comfort, and fun. To us, what that looks like is spending less time traveling to different locales for portraits, less posing and propping, and less being overheated and dehydrated (for some reason couples never drink enough water on their wedding day) and more time spent mingling, hugging, laughing, dancing and of course — eating! Consider allowing the silver lining on this day to be about enjoying a little spontaneity as you celebrate with your family and friends, not timelines and agendas. In our humble opinion, from a photographic standpoint, some of the best photographs from a wedding are the genuine candid moments that go unnoticed or overlooked. We'll be there to capture those. Q: "Do you prefer photographing solo or as a team?" A: While I am comfortable shooting solo, I recommend and certainly prefer to shoot with Larissa as a two photographer team. Though I can't guarantee a specific photo, due to the nature of a live event, a partner arrangement allows us to not only be in two places at once, capture more angles, produce nearly double the final images and allow for quicker transitions between events, but also allows for significantly more opportunities to explore artistic and creative exposures. It lightens the load, so to speak, and gives us free reign to discover lesser known moments and unique perspectives. A: We are natural light photographers. This is a very personal and purposeful art style. We prefer the look of sunlight and generally aim for a more naturalistic look. Using the sun as a light source does have it's challenges, however. The sun's quality and type of photographic light changes dramatically over the course of a day and so time of day often defines our location. For example, during sunrise and sunset, the light is warmer in color and more diffuse. This works great for outdoor photos and can create a very soft and emotional look. It’s for this reason that I often recommend that if portraits of the two of you are important, that we plan some time at the end of the day to step outside for a few minutes about an hour before sunset and take advantage of the great natural light. A lot of the portraits that you’ll see in our portfolio were taken that way and at that time. As an added bonus, couples are often more relaxed and carefree at this time in a celebration, which always makes for more genuine photos. On the flip side, during midday, the light is cooler in tone and hard-edged (contrasty). This works great for shooting indoors or in urban settings where the light can bounce off of buildings or the landscape to fill a room with light. That said, unless it's very overcast or stormy, mid-day sun (between sunrise and sunset) is a very difficult light to work with. The higher the sun is in the sky, the less flattering the light and the more squinty people become. If you're planning an outdoor ceremony without any type of covering, I recommend planning it to happen as near to sunset as possible. The most ideal time for outdoor light starts about two hours before sunset. A: We can't make it not dark without the use of external flash, which is not what we're about. We're natural (available) light photographers and will photograph life as it happened — light included. This includes documenting the space in all of its dark tones and rich colors and ::gasp:: color-tinted up-lighting. We shoot with high-quality Nikon D750's and D700's that have phenomenal image sensors. However, no matter what camera you use, in order to compensate for the lack of light, we have to photograph at what's called a higher ISO. This means images have more grain and ruggedness to them when there's not light to work with. The darker the space, the more apparent the effect. In some circles, a subtle grain in dark images is actually a desired effect and one that's sometimes replicated intentionally. While the images that you've seen here on our portfolio were largely taken outdoors, and that is certainly what we hope for in terms of lighting, we're not at all worried about the dark venues. We embrace the darkness and will use it to feature the atmosphere of your celebration in most beautiful way possible. If absolutely necessary, we can use flash photography. A: We aim for simplicity. Wedding day reveals are notorious for becoming over-planned, over-fabricated, and under-whelming. In truth, what a first-look was meant to be was simply a very brief, quiet moment that a couple can spend coming together, seeing each other dressed up, and maybe share in some private pre-celebration jitters and excitement about the day to come. Some of the most memorable and truly the most genuine first-looks that I’ve photographed have been some of the least planned, least produced, and happenstantial moments. I've photographed these in hallways, on porches, and in backyards. My goal when photographing a first look is less about trying to choreograph and plan some immense performance with city skylines and fireworks, and more so about simply giving you two a private, quiet moment together to simply be with each other before plunging into a fast-paced day of excitement, festivities and cheer — and of course, to photograph that moment to the best of my abilities. Q: "Do you work from a shot list? We have specific planned/posed shots that we want." A: No. We do not work from a shot list. We look at each wedding as unique and individual with its own location and personality. We'll incorporate aspects of the location into our creativity, so your photos will do more than reflect our style, they'll capture the details, locations and elements specific to your day. Every time we shoot, we have one thing in mind: shoot our best wedding to date. The best way to hit that goal is to give our minds complete freedom. We'll take our style and past ideas and build on them while trying completely new things. So each shot will be special to you, not someone else. A: You are more than welcome to think up some specific posed photos that you guys would like to do. While we do consider ourselves photojournalist in shoot-style and we do photograph weddings from this perspective (to be documentarians, not choreographers), portraits are an important aspect. By their very nature, portraits are not candid and do involve posing. On that note, generally speaking, we prefer to keep posing to a minimum, often cueing in on a stance or action that the couple does naturally while photographing portraits and sometimes asking them to "hold it." We also draw inspiration from vintage portraits. To be frank, we usually discourage couples from combing Pinterest and coming to us with a list of images to recreate. There are so many variables from light quality, time of day, environment, and setting and background, that recreating someone else's image is near impossible. We also do not want to stymie our creativity with a checklist. We believe, and we hope that our body of work reflects this, that photography should be true to each wedding, not a re-telling of someone else's. A: Formal group photos — or "mob-shots" as they're sometimes called — are one of those imperishable ancient traditions of yore that we anticipate and plan for at every event we photograph. That said, playing people-wrangler is not. We're happy to shoot any group portraits for you; we just ask that you designate an official people-finder to make sure those who are needed for the photo are present. We often recommend a family member who knows who's who and has a strong, confident voice. When and where to do group photos mainly depends on what kind of photos you would like of your family/bridal party: fun and candid or clean and traditional? Generally speaking, most folks are more loose and active before the ceremony. This is often when we take extra time to do more fun or potentially involved (depending on who's in the photos and where you'd like to take them) photos. However, it’s also harder to find people. During this time there are often family members wandering or not yet at the venue and so we often spend a lot of time with a partial group standing while we wait for someone to arrive or be found. In our experience, if you'd like more of the loose and candid group photos, then giving us extra time to do so before the ceremony is best. It can take some time and sometimes gets a little chaotic, but it also is nice being able to go straight from the ceremony to the party afterward, which is a definite plus. Alternatively, immediately after the ceremony, family and friends will likely already be corralled, standing by your side and in their best behavior — having just been in your wedding, and also having been on display in front of your extended family and friends. They might not be as loose and willing to do noogies and flying-squirrel-chest-bumps in front of Great Aunt Betty, but they'll likely be their most put-together. If you'd like to keep things simple and not overly time-consuming, and would just like a few nice traditional group photos, then doing them immediately after the ceremony is the way to go. Either way, we do it, if you’d like to plan for maximum efficiency, we suggest planning to do only a handful of larger group photos, starting big, with everyone in the frame, and then peel off folks like a banana so that they can be dismissed and may mosey on to mingling. The vast majority of folks choose to do them immediately after the ceremony when everyone is already gathered and in their best behavior. This is the fastest and simplest way to get them done but does require taking the time to do them right after the ceremony. How much time this will take varies wildly depending on your family, friends, venue, weather, and your photography goals. we’ve seen this go as quickly as 5 minutes when, doing 2 or 3 large group photos to document everyone in attendance on each side of the family, and alternatively we’ve also had it go on for 2 hours, involving a coordinator and assistants chewing through an entire printed book (no joke) of different family member combinations and groupings. No matter what, we would add a little extra time for metaphorical fudge as corralling family can be like herding cats and always seems to take longer than expected. Just keep in mind our time and the stamina of your loved ones. A: No, we do not. Larissa and I work together to review all of the images post wedding day. We eliminate duplicate images, test shots, missed focused shots, shots with awkward facial expressions and other images that make you take a second look for the wrong reason. For example, because we shoot with low apertures, sometimes we take a few extra shots to make sure we have the perfect focus. We don’t expect you to have the expertise or the time to zoom into each image to select the one with the sharpest focus, so we spend many hours doing that on our end. In another example, candid laughs and emotional tears are some of the best images from the day. Unfortunately, they can also yield some unflattering facial expressions. We might snap a few extras of any of these moments to make sure we have a great shot with the ideal expression for the moment. With our expertise in processing millions of images, each year, we may eliminate ones that we feel are duplicates and only deliver the best one. A: Yes. We often recommend this as an alternative to the more traditional group family formal photos. In this way, you have a fun where's-waldo style photo of everyone who attended, versus a collection of formal groupings of only a few of the people who attended. We do have a fairly wide angle lens that, in most cases, allows us to capture a crowd. Depending on your venue and the number of folks in attendance, if we can get up above everyone a little bit, we can likely make this happen. A: That number is very unpredictable. However the important thing to remember is that we do not limit how many photos we take nor do we limit how many we deliver. The number of photographs that we take depends on one major factor: How much freedom we're given to explore creative opportunities. The more freedom we have and the more time we're given, the higher the frequency and quality of images. We do not try to reach a certain number of photos, it's quality that we strive for rather than quantity. It's for this reason that we seek clients who are looking for a photographer who is less hands-on and posey — and more candid documentarian. 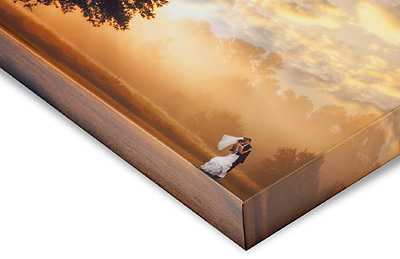 On average, we deliver approximately 400 photos for an all day wedding. A: We have shot at hundreds of venues across the United States, but we're always discovering new ones. We'll be sure to perform a thorough walk-through prior to your wedding to become familiar with the space. A: We have a home in the mid-west but are constantly traveling. We shoot couples all around the world. So, in a word — yes, we do. Our destination wedding photography is simply our standard package, plus the cost of travel and reasonable accommodations as necessary. A: We love to travel near and far. It's for this reason that we charge only the bare minimum to help us accommodate your shoot. Travel is assessed per event. If your wedding or portrait session includes travel by train, plane, ferry boat or other mode of transport (balloon, camel, donkey, etc. ), then we calculate each of those instances separately and include the cost in your custom quote. A: But of course! After your celebration, we begin a careful and meticulous process of backing up, processing, culling, color correcting and retouching your images so that they tell the story of your celebration in the best light possible. Your images will be color corrected to match Folk & Lore’s look and style and retouched by hand. Once your final images are polished and completed, we’ll upload them to a private online gallery for you to review and share with friends and family. This process can take anywhere between 6 to 8 weeks depending on how busy we are. You, your friends, and family may also purchase any prints that you like via your gallery for premium professional prints delivered directly to your door. Printing through us is not required and is entirely a la carte. Your high-quality photo files are then zipped up into easily downloadable folders and delivered via email with links to download all of your final images. Your images will be delivered as high-resolution, watermark-free, JPG’s for fast and easy sharing, storing and printing to your heart's content. A: Yes! You may purchase prints. No, they are not included as part of your package as we aim to keep print choices completely ala carte. Once your wedding or portrait session is complete, we deliver your images directly to you via an online digital gallery where you can view, share, and even order prints of your photos directly from within the gallery. Glossy: Coated paper with a very smooth, shiny reflective surface. Glossy finishes have a high-contrast appearance and look slick to the touch when not under glass. This finish has an excellent dynamic range and color - slightly more "pop" than the lustre paper, though less noticeable once framed. Photos will have a shiny finish, colors will be vibrant, and images will be crisp and sharp. Lustre: Lustre is our premier paper offering, and is considered a professional-grade paper. Lustre has a slight satin-like sheen/gloss with a subtle, often pearl-like texture which you can see when the light angle is just right. This finish features the color saturation of glossy, the fingerprint resistance of matte, without the glare associated with glossy. 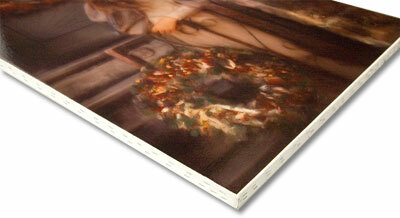 Lustre is printed on kodak supra endura paper, which is heavier than industry matte. Metallic: Our metallic prints are very popular and quickly becoming a standard as our couples' go-to choice. Metallic paper adds a whole new dimension with a greatly enhanced color gamut for rich colors and intense blacks. Prints have a glossy feel to them, but offer a very rich, distinctive silvery look to the colors that faintly resembles old fashion tintype photography. We've heard it best described as "chrome on paper" or as a silvery glow that adds that extra wow. At first glance they appear as simply a color glossy but as you take them in you really experience the metallic tones. They are printed on kodak endura professional metallic paper and are a little more in cost but well worth the investment. Giclée Watercolor: (Zhee-klay) "Giclée" is a french word meaning a spray or a spurt of liquid, however it is not the same as a typical ink-jet printing. Images are generated from high resolution digital scans and printed with archival quality inks onto heavy, 310g paper with a subtle texture. No screens or other mechanical devices are used and therefore there is no visible dot screen pattern within your image. All the tonalities and hues of the original image are there. 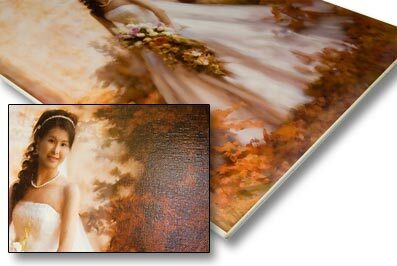 Due to the stunning colors of the archival quality inks and matte finish, your printed photos will take on the look of a masterpiece painting. Print Longevity: Kodak endura is an 'archive quality' paper, designed to last for generations. kodak's tested light-keeping is equivalent to 100+ years before noticeable fading occurs in a typical home display, and over 200 years in dark storage. As for print ordering, our lab handles everything from start to finish. Prints typically arrive a week or less after ordering. They're packaged well but i wouldn't want to leave them in the weather for very long as humidity is unkind to everything. A: No, but we happily and enthusiastically recommend Irish cinematographer Chris Misson (husband of photographer friend of ours). His work is stunningly beautiful. A: Absolutely. We'd be happy to talk with you about your needs. Please contact us for more info. A: Yes. We would love to cover your celebration.